snakebyte group, leading innovators of consumer electronics hardware, brings a new range of advanced charging solutions and battery packs for Xbox and PlayStation® gamers. Utilizing next-generation designs and high-capacity battery technology, the new range of accessories is shipping now, and provide gamers with the extended power they need for ever more complex gaming experiences. Designed to match the design and finish of the PS4™ Pro, the Twin:Charge 4follows the height and shape of the console, blending in seamlessly with the host hardware, while it efficiently charges up to two DualShock®4 controllers. 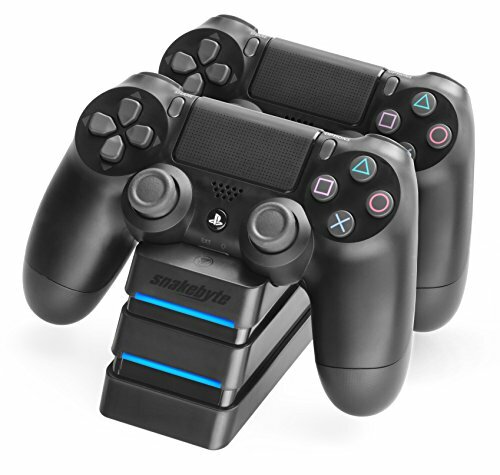 Unlike most other charging solutions available for PS4, the Twin:Charge 4 charges via the data port on the front of the controller, reliving unnecessary stress of the fragile Micro USB ports, and allowing for far easier and quicker docking. Integrated LED lighting allows for easy visual identification of charging status. Designed in Germany for superior quality, the Twin:Charge X includes a charging dock for two official Xbox controllers, alongside two high quality battery packs, negating the need to use standard batteries ever again for your playing sessions. Unlike the majority of battery solutions for Xbox consoles, the Twin:Charge X features high-capacity 800 mAh battery packs, providing up to twice as much power as competitor products. Built in power conductors on the battery packs allow for simple charging, activated the very moment the controller comes into contact with the dock, and negating the need to put undue pressure on the integrated Micro USB ports. Once again, integrated LED lighting informs the gamer as to the charging status of each controller, while the dock itself (available in black or white configurations), perfectly matches the design of the hardware. Quick, simple and ingenious, the Xbox One Battery:Kit effortlessly snaps into place, replacing batteries and the battery cover of up to two official Xbox controllers. Available in black or white configurations to match controller design, the Battery:Kit features twin, powerful 700 mAh high-capacity batteries, providing up to eight hours of gaming between charges, far more than found on most competitor products. Integrated Micro USB port and charging cable included, allows for simple charging via any of the USB ports featured on the console. Integrated LED lighting gives quick and simple indication of charge status for each battery pack. For those serious about gaming, the Battery:Kit Pro ups the ante, offering a high-capacity battery, holding a massive 1500 mAh charge for up to 12 hours of play! Once again available in black or white configurations, the Battery:Kit Proboasts the same features and high quality engineering as the regular Battery:Kit, providing years of battery free gaming.